This is another first-class production from the Atlanta Opera performing at the Cobb Energy Center. Gaetano Donizetti put this one together in the 1800s, and when it was first performed at LaScala, and L’Opera Comique in 1840 it did not generate wild applause. It was first performed in the USA in New Orleans in 1843. The opera is titled La Fille du Régiment and is most often done in French. This was a little bit different in that while the singing is in French, most of the dialogue lines are done in English. Keeps the music flowing and reduces the need for superscript gazing. C’est la vie. Like most operas, the story line isn’t the main attraction; it is the score, the presentation and the action on stage. But it is about a young woman who lost her parents during some alleged combat in the Tyrolean region. She is saved by the men of the French 21st Regiment, and grows up with them as the so called “daughter” of the regiment. If you like the works of Gilbert & Sullivan, you’ll sense how this work may have deeply influenced their modus operandi. In later years she gets into some difficult times when an aristocratic woman finds her and is thought to be the aunt, although things may change in Act II, Auntie wants to have her wed to a proper peer, but she has fallen for a young chap who joined the regiment because he loves her and wants to be at her side, come what may. Seems he also was a savior in some battle. And things do work out in the end, despite some collusion not involving any Russians. The young lady, Marie (Andriana Churchman) is just superb. She does such a great job with every number and her solfège hits are just great. The prim auntie is sung by Stephanie Blythe, and she is also another cast member who has sung with The Met. The aunt, a/k/a the Marquise of Berkenfield is accompanied by her man-servant Hortensius, sung by Tyler Simpson. The lover boy Tonio is sung by Santiago Ballerini who is also a concert pianist as well as fine tenor. And Shannon Eubanks, who has been seen in many plays around here, appears as the Duchess of Krakenthorp, a Trumpish type whose son, Scipion, is to be wed to Marie. That is until Sulpice (Stefano de Peppo) shows up and opens his mouth to the Marquise about some genealogical issues. A full orchestra is in the pit, under the baton of Christopher Allen, and James Noone’s sets are indeed splendid. And our opera company has brought E. Loren Meeker to town to conduct this real winner. She’s another one of those opera members who has worked around the world. What a life it must be. Too bad I can’t sing nor dance . 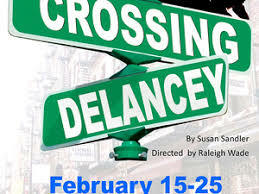 . .
Just a few performances are left, so try to get to see this one. 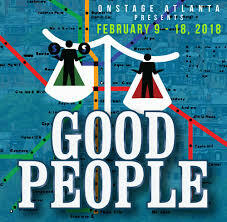 More info and times and tickets are easily found at AtlantaOpera.org. The much acclaimed Topher Payne is a local genius playwright whose comedic works can really knock you out. He wrote this one 10 years ago, and since then has put together a lot of others. But, time has not eroded the essence of the story. 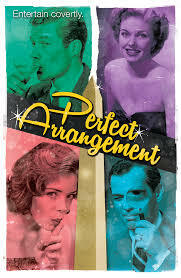 Set in the 1950’s in the DC area, there are two “couples” who aren’t exactly what they appear to be. In fact, the two gay men pose as husbands of the two lesbian women and they literally come, and go, out of the closet (pun intended) in their adjoining apartments. Adam Koplan directs this great cast and they do a fine job of dealing with issues which seem to remain an issue to this day. Joe Knezevich and Anne Marie Gideon play one couple, while Clifton Guterman and Courtney Patterson play the other couple. Things seem to be going fairly well, and one of the guys is a top level security screener in the State Department. But those were the McCarthy days when Communists and gays were openly discriminated against in business and government; even though the FBI chief was alleged to be a cross-dresser, and when there were no gay marriages. Kevin Stillwell plays the head of the State Dept. And Ann Wilson comes on as his weirdo wife, Kitty. Kitty is a piece of work, and then things get even more off balance when Barbara Grant (Stacy Melich) shows up. She had some relationship with one of the other women when they lived in Canada, and now she’s in the same office? Not comfy at all. It’s a typical Moliere farce in that one door closes just as another opens, and characters come and go to a fixed set. But, the issue remains whether any, or all, of the folks are going to stand up and fight for their rights, even though they may suffer the consequences. Remember; this is a nation founded by people who escaped religious persecution in order to inflict their own brand of persecution. Topher’s play really makes one think. Many states now sanction gay marriages. Why should two people who live as a couple not have health insurance rights and survivorship benefits the same as any other couple? We may say that what happens behind closed doors is nobody’s business; so why should any government care? They’re downtown on Luckie Street, and offer discounted parking tickets for the garage next door. For performance times and tickets visit TheatricalOutfit.org. 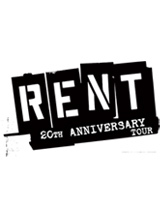 Well they can’t all be winners . . . . Back in 1996 Rent walked off with the Tony for Best Musical and the Pulitzer for Best Drama and it set Broadway in flames with Jonathan Larson’s upbeat adaptation of La Boheme. But this is not your grandfather’s La Boheme by any means. It is more like Opera meets the ’Hood. Rent is definitely a cult thing akin to Rocky Horror Show. It played here on a National Tour in 2004, and is back now for 20th anniversary tour. This is not for the over 70 crowd and you’ll see an audience of much younger folks, many of whom know the score and start screaming at appropriate times just as the song (and I use the term loosely) they cherish is about to break forth. Albeit that Rent is a story about some starving artists in a NYC loft rather than a dreary garret in Paris, this is a typical road show with one set, lots of amplification and neither very memorable tunes nor operatic divas. Probably the only tune most people could even relate to is Season of Love (525,600 minutes). Anyhow, most years have only 524,160 minutes but that wouldn’t scan as well and 1996 was a leap year. The cast is comprised of 15 hard working young men and women who aspire to move on with a career in theater. Working your buns off in a touring company is like paying your dues or being apprenticed to a slave driver. Before you write me off as some kind of Grinch, let me say that for those who love and cherish this show it must be a delight. But, to style it as a musical is akin to classifying The Varsity’s offerings as fine cuisine. The only thing musical about this show is that the sounds generally emanate from musical instruments, except for the echo chamber. The score is not melodic, and a lot of the sounds are often dissonant. If you knew New York, then you know the lower East Side and Delancey Street, which is a main thoroughfare in this old Jewish area, full of delicatessens, clothing stores and so much more. The play, by Susan Sandler originally played in NYC, of course, and got generally favorable reviews, even in the NY Times. If you are old enough to recall the TV series, The Goldbergs, when it aired in black and white in the late 40’s and 50’s, then you’ll absolutely adore this production. Kit Vaupel is Isabel (a/k/a Izzy), a woman who works uptown in a book shop. She comes back to the lower East Side every week to see her grandmother, who is referred to in the Yiddish word, Bubbie. Marla Krohn is the Bubbie and she is a hoot as she tries to get life in order for Izzy, even though her friend Hannah is such a yenta/matchmaker type. Shelly Barnett is also great as Hannah, who needs to know everything, even though she already does know what anybody should do. Izzy enjoys seeing a local author, Tyler (Adam Vann) who stops by the store quite often. They may have eyes for one another, but nothing has come of it when we first meet them. So what’s a Bubbie to do? Can’t have Izzy become a spinster. So why not get her hooked up with Sam, the pickle man? He makes good pickles and could make a good hubby. David Allen Grindstaff plays Sam, who is not as sure of himself as Tyler may be; but he does listen to good advice. And the action ensues. Directed by Raleigh Wade, on a set put together with Amy Szymanski and Tanya Caldwell, this is a truly pleasant experience. And you don’t need to be Jewish to understand what is going on. After all, don’t we all have families? Maybe the Goldbergs, or Archie Bunker, or others? 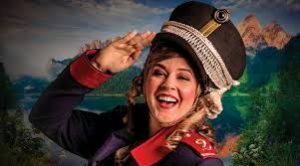 Adapted from Rudyard Kipling’s classic work, this play is one for children and is running at the Porter Sanford III Performing Arts Center in Decatur, south of the I-20, and easy to get to. While the reconstruction of their home base is under way, the Alliance is hitting the road all around greater Atlanta. Rosemary Newcott directs the show on a full stage set to look like a jungle. Caleb Baumann plays Mowgli and boy-monkey, and Nathan Horne is the human. 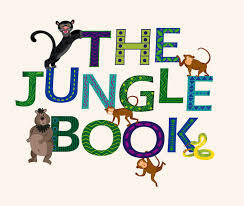 Ashley Anderson, Markelle Gay, J. L. Reed and Adrianna Trachell are the four monkeys. And S. Renee Clark provides the musical accompaniment. The show is for the youngsters and runs about one hour. The issue beneath the scenes is that we need to understand and respect one another regardless of our backgrounds; and that is VERY important in today’s world. 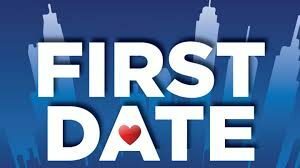 First date, Broadway’s Musical Comedy, is soooo much more than just a musical or the usual comedic presentation. Alan Zachary and Michael Weiner put this together based on the book by Austin Winsberg, and this one has legs for sure. Aaron (Chris Saltalamacchio) is meeting up with a gal on a blind date. The girl, Casey (Ashley Prince) isn’t too sure what she wants out of this meeting, nor are either of them quite into being 100% open with the other. They meet in a café where there are two other couples. Michael Vine and Abi Sneathen are one of the couples and John Jenkins and Becky Ittner are the other couple. 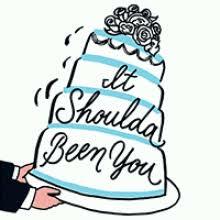 While we never know the names of one of the couples, their reason for being present starts to emerge as the talk fest between the daters goes to highs and lows, and some folks from their pasts seem to emerge. Brian Brooks is on the scene as the restauranteur, as well as some other personae. The play moves along with 11 numbers in Act I and another 7 in the second act. Just know that when they get to the final numbers you do not want them to stop and just wished there were more. Zac Phelps, who is a founder and artistic director for this local theatre group directs the action and also did the choreography, while Laura Gamble is the music director. The music is canned but 100% spot-on and just perfectly timed. The company performs on the Lyric Studio On The Square, which is the black box stage behind the Theatre on the Square. This show is described as consisting of two people, one date, and every single voice in their heads. And so it moves with non-stop laughter and enjoyment. Darren Canady from University of Kansas wrote this one about a couple of social workers trying to deal with problems of clients as well as their own aggravations. It is being produced on the black box stage at Aurora and brings us close to Penni (Brittany L. Smith) and Nathan (Seun Soyemi) who share an office space and are really getting “into it” on a daily basis. 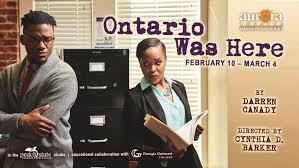 One of their clients is a young man named Ontario. Although we don’t meet him on stage, he is the central focus of the show as Nathan and Penni each try to do for him what they personally deem best in the circumstances. And, not all works out as they would have it; for Ontario nor themselves. Cynthia D. Barker directed this ultra high energy work. While it is very well done, with each actor having to be onstage every minute and recalling the script for 90 minutes act; it may not have legs due to the incessant yelling, screaming and profanities. So just know that while it makes us want to reconsider a lot of governmental issues and other social issues; that it is not for the youngsters nor for Ms. Prim. August Wilson has written many plays about the African American lives in the past 100 years. This is the ninth such play and the tenth was Ma Rainey’s Black Bottom. While he penned quite a few works, he passed away in 2005 at age 60. August Wilson had a difficult life, but basically self-taught himself. He won two Pulitzer Prizes and was awarded a honorary degree from Carnegie-Mellon University. This play takes place in the black suburbs of Pittsburgh in the mid 1980’s. We meet an ex-com, King (Thomas Neal Antwon Ghant), who is recently out of the slammer and trying to build a life. He wants too buy a record store but needs $10,000 to close the deal. His plan is to raise the money by selling off stolen refrigerators, and he brings in his friend, Mister (Eugene H. Russell IV), to aid and abet him in return for a piece of the cake. His mother, Ruby (Tonia Jackson) wants everybody to get on with life; but there are some questions which might might have answered by a DNA test in these days. Ruby’s “friend” is Elmore (E. Roger Mitchell), who also has some problems and his own agendum. The other two players are the old guy next door, Stool Pigeon (Eddie Bradley, Jr.), And Tonya (Tiffany Denise Hobbs) who is King’s significant other. These were the Reagan years, when trickle down economics didn’t seem to trickle down as fast, and as big enough as needed. So as Tony Soprano would say they did what they gotta do to get by. There is some weird stuff in the play as when we find King planting seeds, probably not MaryJane, and then planting a dead cat shallowly. In the event that another life comes to it. There are also stress themes when guns are at hand and some serious feelings get out in the air. The set is by Moriah and Isabel Curley-Clay, who always do an incredible job. Jamil Jude directed this one, with a terrific cast. I guess one of the bottom lines could be that while we’re all entitled to equal justice and treatment; that it may still be a dream akin to wanting to see pigs fly. For a small black box theatre to bring a cast of more than a dozen characters center stage is quite a feat in itself. This musical by Barbara Anselmi with a score by Brian Hargrove is the first class nutty tale of a wedding that could possibly go wrong. I can’t get into the minutia of the story, as you will want to sit through it. It’s one that may bring up some of the older Norman Lear works. Trevor Perry is a riot as Albert, the wedding organizer, as is Eileen Howard as the mouthy Aunt Sheila. You can start off by just imagining this as a cartoon Jewish family, where one of the girls is marrying a gentleman of a different faith. And while it not bother the groom’s father, his mother deals with it by a few more martinis. The wedding rumpus moves through two acts with 19 songs, which bring out more of the essence of each of the characters. I’m not telling you who goes where and how, as that’s the core of the play. I can tell you that you’ll enjoy every minute of it. Kiernan Matts directed this one with the music supplied by Annie Cook. The set designed by Carolyn Choe and Kiernan Matts works sooo well, as any Moliere-type set would. David Lindsay-Abaire has set this play in his old hood. He grew up in Beantown (a/k/a Boston) and while the metro area is made up of more than 4 dozen independent towns and cities, and is one with many cultures; it was one which was also very segregated. The Asian community was downtown, the Italian section was the North End, the Irish were mostly in South Boston while the hoi-polloi lived in Back Bay, Beacon Hill and started the migration westward through Brookline, Newton and Wellesley. So he pulls together a lot of the characteristics of lives in Southie. Jeffery Brown got a good cast together and they do come off with pretty good Bahstin accents, even if they can’t pak their cahs in Harvid Yad. Margie Walsh (Melissa Rainey) is working at a Dollar Store but she has some problems with showing up for work, and her friend, Stevie (Michael Sanders), who is the manager has to can her. So she starts off in her search for some new low-level employment. Stevie wants to be of help, but his resources are severely limited. Life wasn’t easy, living from paycheck to paycheck, and not being on food stamps. Bobbie Elzey and Cathe Hall Payne are a couple of Margie’s BBFs. They all grew up together, and they spew out whatever comes to mind, using the street lingo that made Amy Schumer a hit. One of her old classmates was Mike (Alan Phelps) who managed to finish high school, went on to college and escaped from Southie when he became a physician. Now, he lives in a posh area in the burbs and is married to Kate (Marquelle Young) who is from a totally different background. I don’t like to give away secrets of where a show is going. But, the playwright has quite a skill for enveloping pathos in a skin of hilarious exchanges. And this one ain’t no different. There are good people who want nothing other than to be good for themselves and others; yet sometimes may be seen as not being quite such a goodie. Margie and Kate each have a child, although we do not meet them. 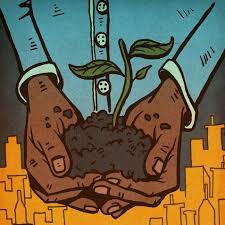 But we do delve into past and present relationships as the tale unfolds. Sometimes you can anticipate the next line, such as when four of them are at a church bingo game and one of them yells Bingo. Well staged production with very entertaining actors. Nobody gets beat up nor killed, but there is plenty of screaming in Act II, so just deal with it.